Two new zero-emissions ferries will enter service in Norway in 2018, both optimized for electric power. Batteries will be the sole power source for two new double-ended ferries being built for operations on Norway’s west coast. The ferries, now under construction at the Tersan shipyard in Turkey and to be operated by Fjord1 and the Norwegian public roads authority Statens Veivesen, will produce zero emissions when they enter service in January 2018. Each ferry will carry up to 120 cars, 12 trailers and 349 passengers on the crossing of approximately two kilometers between Anda and Lote, Norway. The battery vessels will replace diesel power, and the lithium ion batteries will be charged at each side of the crossing. 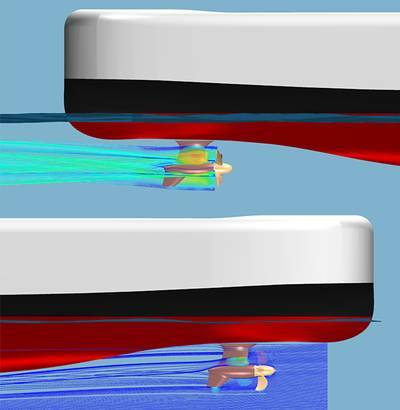 Rolls-Royce said it has been working closely with designer Multi Maritime to ensure that the Azipull thruster propulsion system and hull form minimize energy requirements and deliver sufficient low-speed thrust during bad weather, so minimizing battery size. A single Azipull AZP 85CP-F thruster from Rolls-Royce will be located at each end of a ferry. The pulling propeller and the streamlined lower gear housing provide increased thrust through energy recovery, the manufacturer said. These also provide high efficiency with low vibration, making them attractive for a wide variety of vessel types. And for the new ferries in particular, the Azipull’s controllable pitch and feathering propeller were deciding factors. Studies carried out by Rolls-Royce for the ferry design indicated that in transit the lowest power requirement is when the aft thruster provides all the propulsion thrust and steering. In this mode the forward thruster only represents drag, and the design enables this to be cut to a few percent of the total thrust by setting the CP propeller to the fully feathered position. The full propulsion and steering capabilities of both are available for maneuvering or in emergency. This type of vessel does not turn around for the return trip. The thrusters exchange functions and the previously feathered idle unit provides transit propulsion. Efficient operation over the different phases of the crossing is ensured by combinators that form part of the Rolls-Royce control logic for the Azipull thrusters.